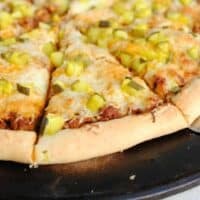 This Sloppy Joes Pickle and Cheese Pizza was a HUGE hit at our house! Even our pickiest eater enjoyed some of this pizza! Do you make homemade pizza at your house, or do you call up a delivery service? (it’s ok to be honest, I don’t judge)!! English muffin pizza: spread a little sauce and cheese, bake, and enjoy. This happens when we are trying to clean out the pantry and fridge before grocery shopping! Have you tried making homemade pizza dough? It’s not hard, I promise. And it’s so rewarding. Today’s recipe makes TWO 12 inch pizzas, which was the right amount for my family of 6. Are you curious about the toppings on today’s “non traditional” pizza? Yeah. I was too! 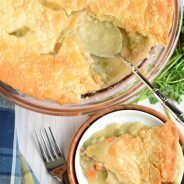 When Fleischmann’s® Yeast sent over a few recipes to add my own twist to and share with my readers, it’s this one that caught my eye. I had no idea pickles on Sloppy Joes was a thing. Until I shared a picture on Instagram, and several of you said you LOVE pickles on Sloppy Joe sandwiches. Then I knew Fleischmann’s® was on to something. I think YOU need to try this one too! The original recipe came from the Fleischmann’s® Bread World website. 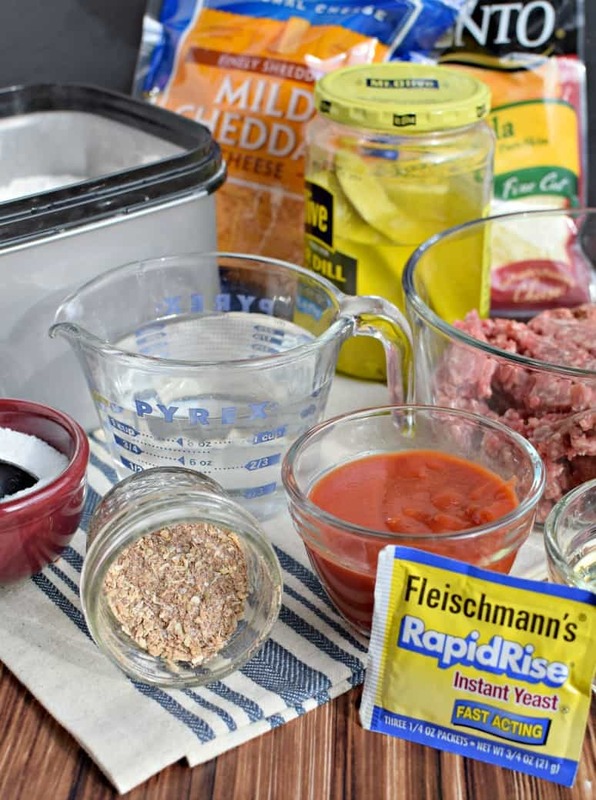 I prefer to make my own seasoning recipes to control the salt and other flavors to my preference (like I did in this taco seasoning recipe) so I put my own spin on it by creating my own blend of Sloppy Joe mix. 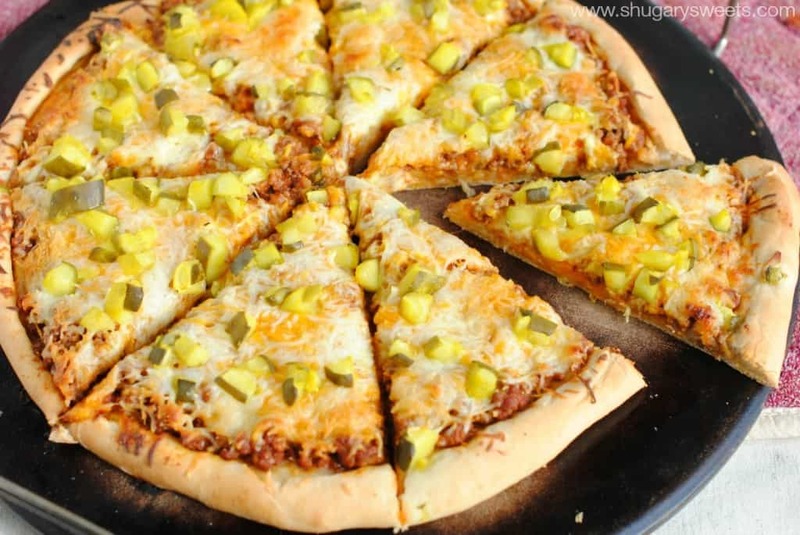 Taco Pizza using this taco seasoning recipe on your ground beef or turkey. Add some shredded jack cheese and green chilies before baking. Once done, top with shredded lettuce, tomato, sour cream and guacamole! Supreme Pizza: top with cooked Italian sausage and pepperoni. Add diced onion, green pepper, mushroom and tomato sauce. Top with shredded mozzarella cheese and bake! Dessert Pizza: spread your dough a little thinner to a 14 inch pizza (instead of the 12 inch). Brush with melted butter and sprinkle with cinnamon sugar. Bake. Once done baking, drizzle with a combo of powdered sugar and milk (whisk together until desired consistency). Oh yum guys. For the crust: In a large bowl, combine 2 cup of all-purpose flour, undissolved yeast, sugar and salt. Add very warm water and oil, mixing until well blended. (I used my electric mixer with paddle attachment). Gradually add the remaining flour to make a soft dough. The dough should form a ball and will be slightly sticky. Knead dough on a floured surface until smooth and elastic, for about 4 minutes (I used my electric mixer with dough hook attachment for this part instead, it worked great!!). Divide dough in half and cover with a clean dry towel until toppings are ready. 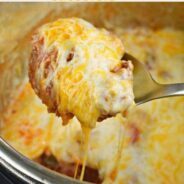 Cook and crumble the ground beef in a large skillet over medium high heat. Drain off the excess grease and return meat to the skillet. Add seasonings, water, and tomato sauce, mixing until fully blended. Simmer on low heat for 2-3 minutes. Pat each portion of dough with floured hands to make a 12inch round pizza (using a baking pizza stone or round pizza pan). Form a rim by pinching the edge of the dough. Spread half of the warm Sloppy Joe mixture onto pizza crust. Top with half the mozzarella and half the cheddar cheese. 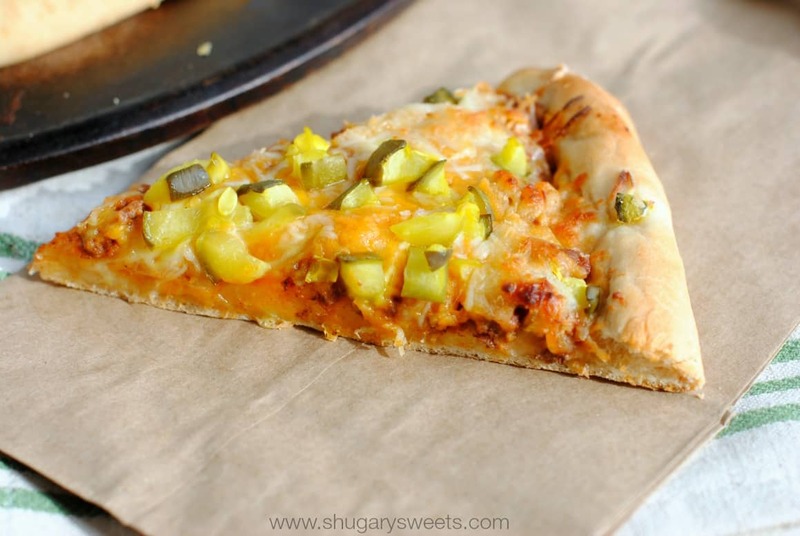 Sprinkle half the diced pickles over the pizza. Repeat with the second pizza. Bake in oven for 18-20 minutes, until cheese is bubbly and melted and the crust is browned. Slice and enjoy immediately!! Aimee, this sounds amazing! 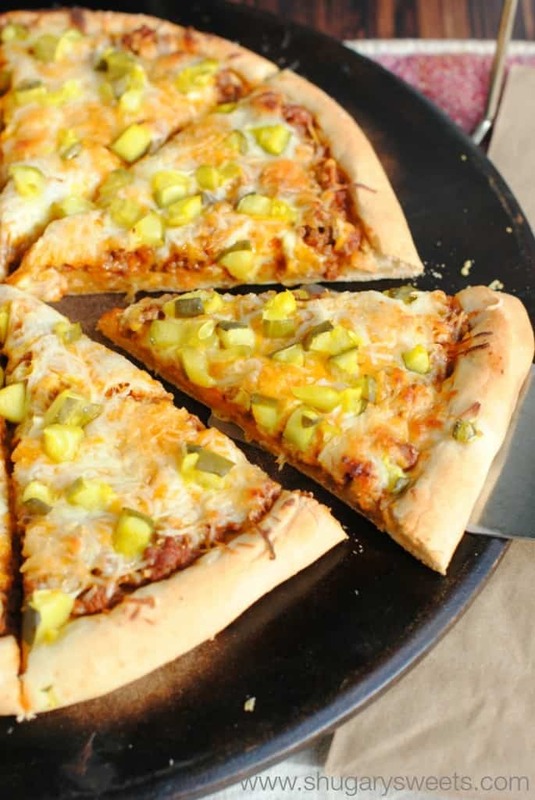 Sloppy joes on a homemade pizza crust… with pickles! I want to try it soon! Pinned! Thanks for pinning Jen! You must try it, my sweet hubby looked at it like I was crazy (or pregnant) and loved the flavor combo!! This pizza is insane Aimee! What have you done to me? Don’t you know I am starting a major detox in a couple of days. Sigh, this is magical. I don’t even eat meat but the thought of the tanginess of the pickles, with the cheese, I’d have this for breakfast 🙂 I bet this was so good – and so creative! You can totally go with the seasoning and cheese, and pickles!! 🙂 Happy New Year!! I love making my own pizza and this one looks out of this world! Fabulous flavors!! 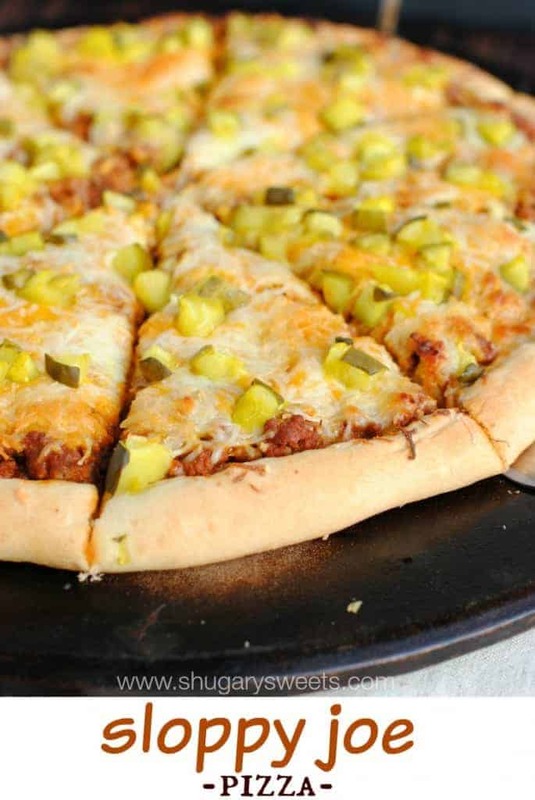 I never thought about pickles on a pizza, but I love me some sloppy joes so I’ll have to try this. 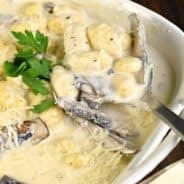 Your recipe came over on my Bloglovin feed and I’d love it if you would share it at my Tuesday link party, Tickle My Tastebuds . Pinned! What a creative combination, I’ll have to give this a try for sure! What great flavors for pizza! This one needs to make an appearance at our next pizza night! So this is what you were up to! Can I tell you how much I love the addition of pickles on this pie? Genius! Haha, I’m so sneaky 🙂 No seriously, you have to try this!! Sloppy joe PIZZA? With all the fixins’? Well twist my arm why dontcha’….this seriously looks amazing, Aimee! Our pizza night around here needs this! This pizza looks amazing! Love it- those flavours all are delicious! Definitely cannot wait to try the recipe soon! How fun! What a creative and fun pizza toping! Thanks Laura, Happy New Year!! This sounds so crazy but I bet it was delicious. I would have loved to have tasted some. Guess you just have to put it on your menu 🙂 ENJOY!! I’ve never thought of putting pickles on pizza but that sounds really good! Thanks for the post! I’m not sure about pickles on my pizza, but the dessert pizza sounds good – that’s always one of my favorite at CiCi’s!